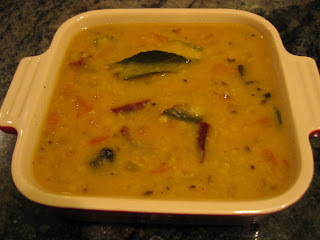 Dal tadka is something very easy to make, and very delicious too. This is something that P enjoys and I make often. Posting this recipe for some 'bachelor' friends. Wash toor dal (with just enough water to cover the dal) & pressure cook (3-4 whistles) with kokam (if using). Mince ginger & garlic. Slit green chillies length-wise. Chop onion & tomato. Heat ghee in a skillet, add mustard, saunf - let it splutter. Add pepper, cloves & kashmiri red chilies. Saute for a minute. Throw in the curry leaves & saute for another minute. Add ginger, garlic & green chilies. Saute another minute. Toss in onions, sauteing till it starts turning brown. Add tomatoes. Saute till almost cooked. Pour in cooked dal and salt to taste. If too thick add a little water. Simmer and let stand for 1-2 minutes. Break corainder sprigs into pieces and add to the dhal. Add lemon juice to the dal jsut before serving. (only if not using kokam). This dal tastes best with fresh ginger / garlic / green chilies. Moong dal can be used instead of toor. If you don't have saunf, use jeera instead. Don't feel like mincing ginger / garlic? - use the ready-made paste. hey Gee..Thanks for the post...I'll try it over this weekend..hope ur enjoying your trip! Take care..
let me know how u like it arun.. It was really nice cooking those simple but tasty dishes! !...thanks for your recepies! !..will look forward for more of it in the coming days. read ur post abt abt ur cooking experiments too!! thank you! welcome Shan... :-) it is a pleasure! !